Once the Prophet was a man of vigor and strength. Some harrowing experience has aged and diminished him, leaving him blind and almost feeble. The Harborage is a cave in the wilderness which the Prophet has adopted as his home and refuge. 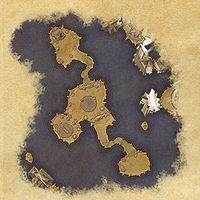 The cave is located near the first major city of each alliance, and serves as the starting point for each stage of the Main Quest. 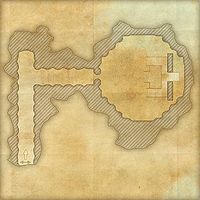 The Aldmeri Harborage is located in Auridon, in a seaside cave east of the city of Vulkhel Guard. 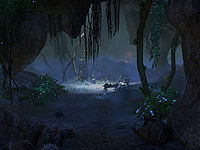 The Daggerfall Harborage is located in Glenumbra, in an abandoned cave southeast of the city of Daggerfall. The Ebonheart Harborage is located in Stonefalls, in a Daedric ruin west of the city of Davon's Watch. 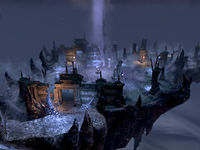 Ironically, the ruins seems to have been dedicated to Molag Bal at one point, as evidenced by the banners displaying his symbol. 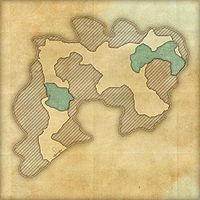 Like wayshrines and certain types of dungeons, the Harborage can be directly fast traveled to. If you visit the Harborage earlier than level 5, you'll find a purple force-field preventing you from entering. 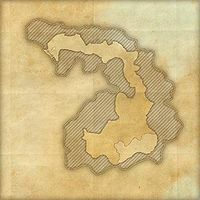 While there is a Harborage in all three Alliances, you can only access the one in your own Alliance's territory. Between Updates 9 and 12, you could also access other Alliance's Harborages. After being called to the Harborage by The Prophet it was possible to continue the quest inside any Harborage, however, you would always be sent to your own Alliance's Harborage at the end of the quest. This page was last modified on 22 November 2018, at 08:01.